Here's my card for the current sketch at Freshly Made Sketches. I used the layout to create a teacher themed design. The rectangular panel was made from gray cardstock and stamped with white ink to give it a chalkboard-like appearance that's appropriate for a school themed card. 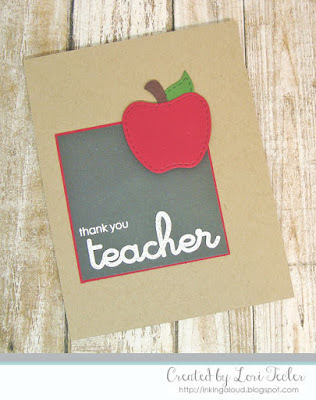 The stamped sentiment from the Lil' Inker Designs Teacher Talk set was heat embossed in white to stand out. I matted the panel on contrasting red cardstock, then adhered it to a kraft card base. The apple element was die cut using LID's Apple Shaker die set and a bunch of cardstock scraps. After assembling it, I used foam tape to adhere the apple to the upper right corner of the sentiment panel to finish the design. What a great use of the sketch! Your chalkboard looks fabulous and the white sentiment is perfect! Thanks so much for joining us at Freshly Made Sketches. This is perfect, Lori! I love this teacher card!